Our guest blogger this week is Dr James Moher (former CWU & T&GWU official). This is part one of three. I had been enthused by Lenin’s picture of an electric republic, organised on such lines as would ensure to every citizen, however humble, the advantages of a planned economy and the blessings of modern civilisation. Walter Citrine, aged 36, became Assistant General Secretary of the TUC in January 1924. A Merseyside electrician and Electrical Trades Union national official, he was appointed because of his reputation as an innovative union administrator. As Merseyside District Secretary (1914-20) and and Assistant General Secretary of the ETU at their Manchester headquarters, he was also an experienced union leader and negotiator. In 1920, Citrine had produced the first version of his famous ABC of Chairmanship as guide to the conduct of [often lively Merseyside ETU branch] meetings. It would become the standard work for generations of union and Labour activists, as Alan Johnson recalled in his memoir of his UCW days. He was also quite left-wing (Independent Labour Party and a Labour candidate in the 1918 general election for Wallasey) at the time, which suited the Left- led General Council with Fred Bramley (1876-1925) as General Secretary and Alf (A.A.) Purcell (1872-1935), as chair. He was appointed from a large field of candidates and came to live initially in the Clapham area with his wife, Doris and their two young sons, one of whom (Norman) would one day be the TUC’s Legal officer and author of an important book on union law. Although taken on primarily for an administrative role, the poor health of Fred Bramley and his frequent absences on foreign affairs also, brought his deputy quickly into the wider affairs of the TUC. This included assisting in relations with the Russian TUC leaders who were visiting Britain in 1924 for trade talks and their application to link up with the International Federation of Trade Unions in Amsterdam. The Russian delegation was led by the chair of the All Russian Central Council of Trade Unions, Mikhail Tomsky (1880-1936), and they were impressed by Citrine’s office with the revamped administrative system which he had just introduced. Citrine would became famous for his new filing system especially, though some ‘super socialists’ who knew little of trade union organisational needs, sometimes sneered at such mundane innovations. However, Tomsky who was well aware of the shortcomings of the young Russian unions in this respect, invited him to visit and advise on theirs. Eager to help, the TUC leadership agreed to his going to Russia, though Citrine had only just started in his new post. There had been a significant shift to the left on the General Council since Fred Bramley became General Secretary in 1923. A cabinet-maker by trade, he was a staunch ILP socialist from west Yorkshire, as well as being National Organiser for a small craft union, the National Amalgamated Furnishing Trades Association (NAFTA). On the TUC Parliamentary Committee since 1915, he was also chair of the London Labour Party (1915-19) and had strongly opposed the war and welcomed the Russian Revolution. He became a full-timer as Assistant General Secretary in 1917 and was instrumental in replacing the Parliamentary Committee with the far more industrially-focussed General Council in 1921. When the first Labour government was formed in January 1924, Ramsay MacDonald, the new Prime Minister, had invited a number of leading trade union figures to join the government – J.H. ‘Jimmy’ Thomas of the NUR, Margaret Bondfield of the GMWU, amongst others, all from the General Council. This left some significant vacancies on the General Council as Bondfield had been chair that year and Thomas vacated the Presidency of IFTU and chair of the International Committee. Alf Purcell, a very left-wing Council member, assumed the chair as well as the IFTU Presidency. He had communist and syndicalist sympathies, though he had just been elected as the Labour MP for Coventry. A French Polisher by trade from the same small craft union, NAFTA, as Bramley, he was for years chair of the very left and influential Manchester and Salford Trades Council. Purcell had been chair of the Hands off Russia campaign which led the TUC to threaten a general strike against British government armed intervention against the Bolsheviks in 1920. He had visited Russia on a Labour delegation that year and again led a TUC delegation there in November 1924, when he was awarded honorary membership by the Moscow Soviet. Citrine said that he relied on Purcell’s advice as Chair of the General Council in Bramley’s absences on all key matters. The other key left-wing General Council member was George Hicks (1870-1954), who would accompany Citrine to Russia in 1925. He was a bricklayer and General Secretary of the recently amalgamated building trades union, the AUBTW, whose offices were in Clapham, where Citrine also lived until he moved to Harrow in 1925. It was their large membership which put Bramley and Purcell on the General Council from his electoral trade group. Hicks replaced Thomas as chair of the important International Committee and at the IFTU in Amsterdam, where he was a strong supporter of the Russian unions’ bid. He was deeply involved in the General Strike and chaired the General Council 1927-8 and became a Labour MP for Woolwich East in 1931. He was a close associate of Purcell’s, having both been active in Tom Mann’s Industrial Syndicalist League (ISEL) before and during the war. Many other TUC leaders were also very supportive of these pro-Soviet policies at that time. Alonzo Swales, General Secretary of the Amalgamated Society of Engineers (AEU) and chair of the General Council after Purcell, chaired the meetings of the Anglo-Russian Committee. Ben Tillett (1870-1952), of the Transport & General Workers Union and a legendary leader of dockers’ strikes, was a leading member of the 1924 delegation to the USSR and an enthusiastic supporter of the new ‘Workers Republic’. Ernest Bevin, who had become the new T&GWU’s General Secretary in 1922 and joined the General Council in 1925, though generally supportive, was not involved much. Arthur Cook who took over as Secretary of the Miners Federation in 1924, was one of the strongest supporters of the Soviet link. Will Thorne of the GMWU was always supportive of Bramley and Purcell on IFTU delegations, though not greatly involved. It was this TUC leadership that Citrine now found himself serving congenially as their policies of building up a strong union centre accorded very much with his own left-wing views. 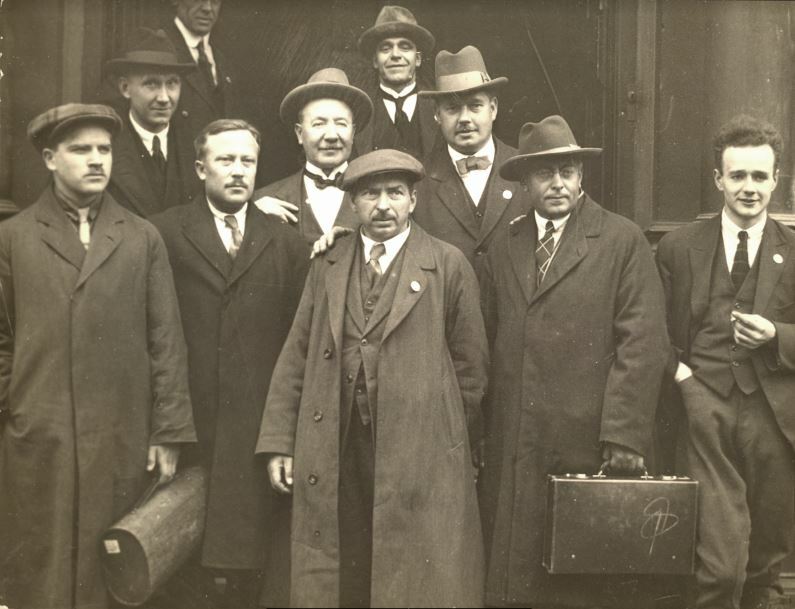 Soviet trade unionists attending the TUC conference in Hull, September 1924. Centre front: Mikhail Tomsky, the chair of the All-Union Central Council of Trade Unions (VTsSPS). At the back, Citrine, Swales and Hicks. A warm and friendly liaison developed with the Russian union delegates when they came to Britain in 1924 as part of a trade delegation, led by the chair of the Russian TUC, Mikhail Tomsky. Their trade talks with the Labour government were successfully concluded in August 1924, with significant TUC input. The TUC invited the Russian union delegation to Congress at Hull in September 1924 and Tomsky’s address was greeted enthusiastically by the delegates who endorsed the General Council’s new policy. In return, a full delegation, led by Bramley and Purcell, were invited for an extended tour of Russia later that year. 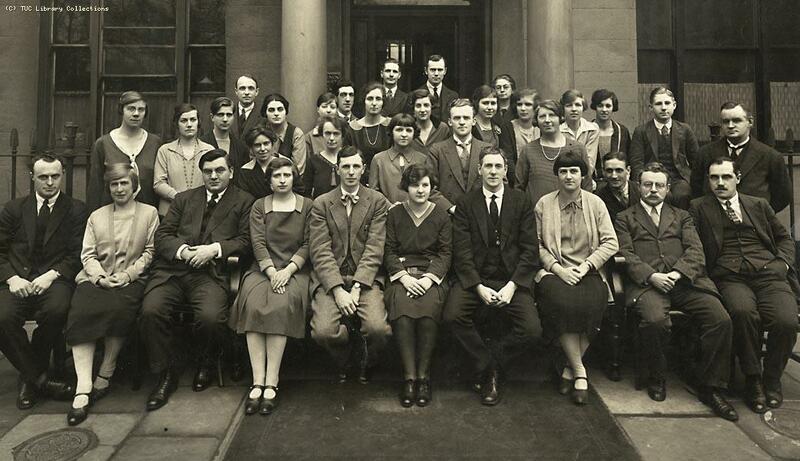 On their enthusiastic return in 1925, they formed a high-profile Anglo-Russian Joint Advisory Council (ARJAC) to promote their admission to the IFTU and other aims. This committee – including Tomsky, Aleksander Dogodov and Grigoriy Mel’nichansky who would later chaperon Citrine and Hicks around Russia – met at the TUC offices a couple of times that year and Citrine assisted Bramley in officering the Council. His trip to Russia later that year seems to have been an outcome of those contacts. They travelled overland with the Russian trade delegation. The Russian TUC (the All Russian Central Council of Trade Unions), had recently rationalised over a thousand small bodies into twenty-three industrial unions with about 6 million members and their head offices were all housed together in a huge Palace of Labour in Moscow. The British visitors were not impressed by the efficiency of the system of administration or the old-fashioned equipment there. However, they recognised why their history and recent civil war, (in which the unions had played a significant role in support of the Bolshevik government), had prevented a more normal evolution. They spent most time in and around Moscow, visiting the Kremlin and other sights. They weren’t sheltered from the many problems facing the authorities – dilapidated Tsarist-era tenement housing and other buildings; many orphaned children (from the Civil War and famine years), sleeping rough in the cold with very scant clothing. Citrine commented a lot on the role of women in the countryside, who seemed to be doing most of the heavy labour. The benefits system was explained (unemployment and strike pay only was paid by the union, the State paying sickness and superannuation benefits). Also the union contribution system with employers contributing also. They visited Leningrad for a few days but then set off to the Crimea. Their trip was made particularly interesting from the frank and forthcoming exchanges they had with their senior union hosts. They had many late night sessions with Tomsky, Mel’nichansky, the Organising Secretary, (whose English was quite good as he had spent some time in Canada before the revolution) Dogodov and Yarotsky (translator, also a Bolshevik activist). They talked freely about who would succeed the late Lenin as leader from which it was clear that an intense power struggle was well under way. Citrine was surprised to learn that Trotsky was not favoured by the unions on account of his proposals for turning them into functionaries of the socialist state. They preferred Stalin’s more ‘down to earth’ approach, ’although no one could replace Lenin’. Citrine and Hicks were shocked to find that Lenin had become a god-like figure since his death, whose every utterance had to be treated as ‘gospel’. Even Hicks, an old-school Marxist, remarked on it. They also had an interview with Gregoriy Zinoviev, Head of the Communist International since 1919. It was his purported Red Letter in 1924 (a forgery but widely believed at the time), urging British communists to infiltrate the troops in preparation for an English revolution, which helped bring down the Labour government. Citrine and most at the TUC, believed that the huge pre-election publicity given to this Red Letter and MacDonald’s handling of it contributed to the defeat of that Labour government. Zinoviev brushed aside any such discussion and was more concerned to tackle the visitors about the recent decision of the Labour Party to disaffiliate the CPGB. In the Crimea, they learned of TUC General Secretary, Fred Bramley’s sudden death early in October 1925 at Amsterdam. Citrine was summoned back to London to act as General Secretary. It evidently came as a great shock to the Soviet leaders also as Bramley had been their great friend at the IFTU. They arranged a special event to mourn his passing, mounting a full-blown picture prominently with full honours. Citrine and Hicks were given a warm send-off despite their (especially Citrine’s), sometimes more critical engagement with the Russian trade union leaders.